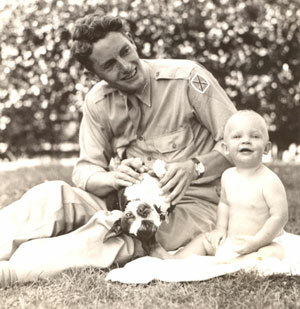 David Brower with 1-year-old son Kenneth Brower. I'll never forget the last time I saw David Brower. It was at Alta Bates Hospital in Berkeley, California, a week before he died in November of 2000. Author and farmer Michael Ableman and I had come by for what we knew might be our final visit. Though pale and gaunt, Brower still spoke with passion and clarity, and when we were leaving, I tried adding a note of optimism to the occasion. "The next time I see you, I hope you'll be out there fighting the good fight again," I said with a smile. Brower looked me directly in the eyes and offered a calm farewell. "I don't think that's in the cards," he replied, "but it's been a great 88 years." It's no exaggeration to say that David Ross Brower was the heir to John Muir and the most influential environmentalist of the 20th century. Brower, were he still living, would have turned 100 this July 1. Former Interior Secretary Stewart Udall called Brower "the giant of the conservation movement," while author John McPhee labeled him its "pre-eminent fang." Though Brower's name is hardly a household word, his lifetime achievements are the stuff of legend. As the Sierra Club's first executive director, Brower turned it into one of America's most powerful organizations. He led the battles that helped create nearly a dozen national parks and saved both Dinosaur National Monument and the Grand Canyon from being drowned by power dams. Udall, who originally favored the Grand Canyon project, came to oppose it after Brower waged a campaign to stop the dams. "David Brower changed my thinking about the Grand Canyon," Udall told me years later. "And for that, I'm in his debt, no question about it." Brower was "chief lieutenant" in Howard Zahniser's successful efforts to pass the Wilderness Act in 1964. The series of large-format coffee-table books he pioneered with the Sierra Club won support for dozens of global conservation efforts. Combining fine prose and poetry with the photographs of masters like Ansel Adams, they were powerful pleas for a more compassionate approach to the earth and all living things. Recently, I reread the first of them, This Is the American Earth. It has not lost its impact in 50 years. Brower was also an effective filmmaker, whose documentaries (including the beautiful Wilderness Alps of Stehekin) won reluctant congressional leaders to his causes. He was often ahead of his time in the environmental battles he waged (in his early opposition to nuclear power, for example), a precociousness that sometimes brought enmity even from his friends. He was indomitable. When the Sierra Club board fired him for insubordination and reckless spending in 1969, Brower wasted no time mourning and started a new organization, Friends of the Earth. Sixteen years later, FOE fired him too, again for spending that organization into debt. Brower responded with a snappy, "It's more important for the earth to be in the green than for Friends of the Earth to be in the black," and rolled out yet another organization, Earth Island Institute. But his Earth Island colleagues had wised up a bit: "We all love Dave," one of them told me. "But we don't let him get close to the money." In time, Brower mended fences with the Sierra Club, joining its board of directors, and receiving its prestigious John Muir Award. Not one to carry a grudge, he became friends again with his detractors, among them Ansel Adams, who had voted to fire him as executive director. One day, not long before Adams died, I interviewed both Ansel and David in Yosemite Valley. The years had renewed their affection for each other, and they made a charming couple: Brower, clean-shaven, tall, and straight like the Campanille on the UC Berkeley campus; Adams bewhiskered and cherubic. They spoke of their common foe, Ronald Reagan's Interior Secretary James Watt, who believed that we needn't worry about what we were doing to the earth because the second coming of Jesus was imminent. A few years later, Brower and I again walked through Yosemite Valley. He spoke of how much that exquisite place meant to him and how, despite the crowds, it still seemed as pristine to him as it did when he worked there in the 1930s. "That's the national park idea," he said. "Let people see it, but protect it, so future generations will also have it." Brower was born in Berkeley in 1912 and spent most of his life there, except for military service with the Tenth Mountain Division overseas during World War II. He helped pioneer the sport of rock climbing on local crags and on towers like New Mexico's Shiprock, a 2,000-foot monolith thought unclimbable until he did it with three other Sierra Club climbers in 1939. His passion for saving wild places was the result of months spent hiking and climbing in California's High Sierra, where he is credited with the first ascent of more than 70 peaks. "When David is in the mountains, he becomes like a child again," his wife, Anne, once told me. "The smallest flower can just fascinate him for hours." Yet, in later years, Brower seldom got to the Sierra, caught up instead in his dedication to conservation work. He complained that the mountains in his life were the enormous mounds of paper that cluttered his desks and surrounded him like prison walls. I got to the Sierra occasionally with David and Anne. Once, I rode there with him. His eagerness to reach Yosemite kept his pedal to the metal far too dangerously for my tastes; there was a bit of the spirit of Mr. Toad in him. We stopped by a small pond on Yosemite's Tioga Road with a perfect reflection of Mt. Dana's red pyramid. It was his jumping-off point for a cross-country jaunt to a green velvet meadow he called "Brower's Bench." He and Anne wanted to have their ashes scattered there he told me; their son Ken assures me that should happen soon.